If I ever happen to be condemned to die by lethal injection or perhaps a more cruel and unusual punishment such as being forced to listen to nothing but 50s music, I know exactly what I’d request for my last meal: chicken ‘n dumplings. Not just any old chicken ‘n dumplings. I’d have to insist on somebody’s grandma’s chicken ‘n dumplings. Just as New England and Manhattan have distinctly different versions of clam chowder, Southerners have two kinds of chicken ‘n dumplings. Actually, the “chicken ‘n” part pretty much stays the same. But the dumplings are either flat or puffy. I’m not sure if it’s a regional issue or just a matter of personal taste. I, myself, prefer puffy dumplings, probably because I can’t quite fathom the distinction between a flat dumpling and a noodle. One of my favorite things about going home used to be the chicken ‘n dumplings that Donnie would bring over. One of the perks of being a Baptist preacher’s kid is that folks are all the time dropping by with food. How this got started, I do not know. I’ve learned not to look a gift horse in the mouth and ask “why?” seeing as gift horses are easily spooked. Years ago, my mom told Donnie (who’s female, by the way – in case you were wondering) how much I loved her chicken ‘n dumplings. Whenever I rolled into town, she’d bring over a big pot full of them. Hoo boy! One year around Christmas time, Donnie called to say she was dropping something off, so I hastily pulled out a bowl and spoon in anticipation of her arrival. 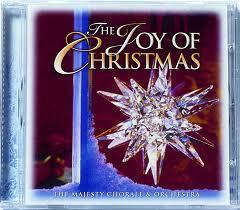 Ten minutes later, my mom goes to the door and comes back with a CD of Christmas music. What? No steaming pot of creamy chickeny dumplingy goodness? No cornbread? Not even so much as a lima bean? Nope. A CD. That’s all. Nothing else. Later my mom called to thank Donnie for the CD and just so happened to mention how much we’d appreciated all those pots of chicken ‘n dumplings. She might have added how much I love them and how I never get them in Seattle and also that Donnie’s dumplings were my absolute, all-time favorite ever. Would you believe it worked? I still feel a bit guilty for conspiring to flatter a senior citizen into making me some chicken ‘n dumplings. Nevertheless, I’m glad I did. And if I’d known they’d be the last I’d ever see of Donnie’s chicken ‘n dumplings, I would have stashed some in the freezer. Also, asked for the recipe. Done right, chicken ‘n dumplings are so good, even vegetarians can’t pass them up. Ok, maybe not all vegetarians, but at least one. However, I should probably qualify this by mentioning that my sister’s friend David isn’t exactly a lentils and tofu vegetarian. Soon after he’d adapted the vegetarian lifestyle, he commented that he’d thought becoming vegetarian would make him lose weight. Someone kindly let him know that most vegetarians don’t subsist on Ho-Hos and Doritos. He happened to walk through the kitchen and caught his grandmother in the midst of dumpling making. What was that in her hands? A CAN of biscuits? THAT was the secret to pillowy dumpling deliciousness? 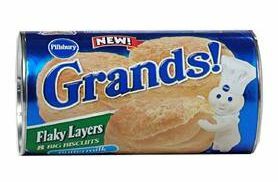 Canned biscuits? It was enough to send him running back to traditional vegetarian fare such as French fries and Little Debbie snack cakes. Although, I imagine he ate at least one last bowl, for old times sake. If anybody has a good chicken ‘n dumplings recipe, please let me know. Full disclosure: I’ve made them with canned biscuits and they turned out ok, but I’d prefer to make the dumplings from scratch. Photo credit: Southern Style Chicken and Dumplings by Back to the Cutting Board: this will be the next recipe I try. Yum! Welcome!! Glad you’re enjoying the blog. You’ve prompted me to finally include a link to my twitter account. I’ve been a reluctant tweeter, but I’m slowly getting the hang of it. I live in Sitka Alaska but was raised in the Southeastern parts North Carolina. Whenever I happen to find myself down there, I always go straight to Granny’s for her chicken n dumplins. Her dumplins? cheap canned biscuits. I was so surprised when I found out. But MAN do I love them! and wouldnt want it any other way. I have tried to make them like her before but they never taste the same. There must be some secret ingredient that older Southern ladies use to make chicken and dumplings taste so good. I’d love to know what it is. My brother lived in Sitka for a while, and I visited one summer. It’s an amazingly beautiful place. Not a lot of chicken and dumplings though. We used to send my sister-in-law care packages of grits. I once started a novel set in the South in which the lady of the house serves “chicken ‘n dumplings,” which the author describes as a platter of fried chicken and a platter of dumplings. Needless to say, I stopped reading at that point. Several times I’ve written down the “recipe” as my stepmom made chicken ‘n dumplings from scratch the way her mother taught her. I now have three slightly different versions and I’m afraid to even try in case they don’t come out as tasty as hers. I think you should go ahead and try. Even bad chicken and dumplings are still pretty good. I too prefer the thick dumplings. I have fond memories of eating them at covered dish lunches after church, funerals, Christmas, well…anytime actually. It was a staple in my family. Sadly, I have no great recipe. But my grandmother used Bisquick, I believe. Man, what I would give to have some right now. I think maybe you have to be a grandmother to make really good chicken and dumplings. I don’t know why, but my grandmother was convinced that dumplings should be yellow, so she added food coloring to hers. That’s hilarious! Also, downright frightening. Perhaps even worse than my brother’s Christmas specialty: Dyed red mashed potatoes with dyed green gravy. My paternal grandmother (Charlotte) did the same thing. But my maternal grandmother (Smithfield, NC) did not. As a kid, the yellow v white was contest. To this day, I’ll only eat them if they have a little bit of yellow color to them. It’s like sunshine on a plate! Here’s the recipe I grew up with in Lonoke, Arkansas. Mix flour and salt in a large bowl. In a separate bowl, stir the oil, water, and egg until well blended. Add the liquid mixture to the large bowl and mix into a firm dough. On wax paper, roll dough out into a large oval, lightly flouring to keep from sticking. Cut into pieces about the size of a postage stamp (a pizza cutter works great). Drop pieces of dough a few at a time into boiling broth (strained), stirring often and adjusting the heat to keep the broth at a rolling boil. When the dumplin’s all stop floating, reduce heat and simmer about 30 minutes or until dough is cooked through, gently stirring occasionally to keep from sticking to the bottom and scorching. Add deboned chicken. I almost always double this recipe, using 8-10 thighs and enough water to cover the chicken and a few yellow onions, salted to taste. I love dumplin’s so much. This recipe came from a dear aunt who has always made them for church dinners, funerals, holidays, reunions, birthdays, get well food, etc. She made them last weekend at the lake (multiplied the recipe by 8!) and they were so good, I craved more all this past week. I made some last night and have eaten them for all three meals today! Enjoyed reading about your love of them, too. Wow! Thanks for the recipe. Those dumplings sound like just what I’m looking for. I run across a lot of dumpling recipes that call for just flour, water and salt (even Ms. Paula Deen’s!). I always thought that didn’t sound quite right, so I look forward to trying your aunt’s recipe! Stew a hen for a couple hours (it must be a hen according to my mom and grandma) in water and 1/2 stick of butter (yeah, I know). Add generous amounts of salt, pepper. When it’s done, remove the hen and shred the meat ( it should pull off pretty easily with a fork). Put the meat in a bowl with approx 1/2c milk and let it sit for 30mins. (i have no idea why this is done but its what the recipe said and the end result is so good I’m not changing it). Skim the fat from the top of the broth (you can chill it first to help the fat congeal – I usually put it and the bowl w/the milk chicken in the fridge overnight). taste broth and adjust seasonings as you wish (I usually add a little poultry seasoning and a bay leaf when I’m stewing the chicken). My grandmother was like the other poster and used yellow food coloring to make the broth a pale yellow. I prefer that look too (the white ones look like hospital food to me) but I try to stay away from additives (sorry g’ma) so instead of food coloring, at my mother’s suggestion, I use a little bit of turmeric — adds color and doesn’t mess with the flavor (yay, Ma!) . Put dumplings into broth (if you’re using Annie’s slice the into smaller pieces) and add chicken/milk mixture and a bit more butter. Cook until dumplings are tender w/a slight bite. AMAZING!